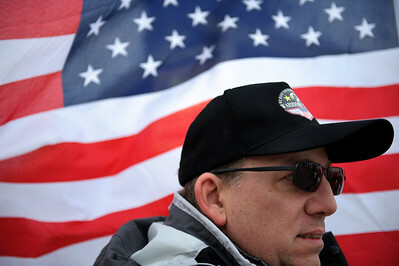 Daniel J. Murphy - dmurphy@shawmedia.com Dennis Pignatari of Gurnee, IL awaits the arrival of Spc Donnie Rowden IV at KC's Cabin Saturday March 3, 2012 in Spring Grove. 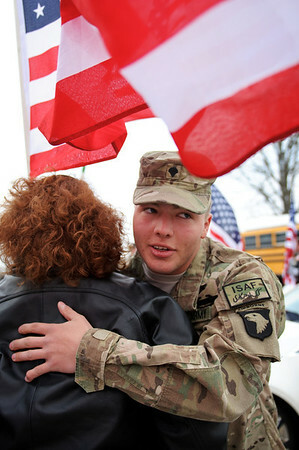 Donnie was welcomed home by family members, friends and various veteran's groups. Daniel J. Murphy - dmurphy@shawmedia.com Spc Donnie Rowden IV was welcomed home by family members, friends and various veteran's groups at KC's Cabin Saturday March 3, 2012 in Spring Grove. Donnie is 21 years old and a Pathfinder with the 101st Airborne. He completed AIT and Jump School at Ft. Benning, GA. Deploying from Ft. Campbell, KY in February, 2011, the 19 CAB Unit just returned from Afghanistan. An avid outdoorsman, Donnie enjoys fishing and hunting and computer games. Before graduating from Antioch High School in 2009 he wrestled and ran track and now looks forward to attending college after completing his service. 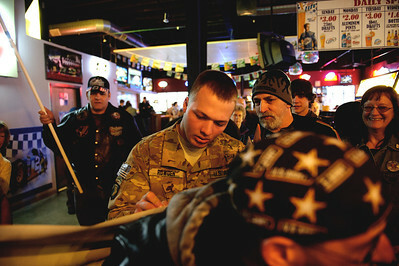 Daniel J. Murphy - dmurphy@shawmedia.com Spc Donnie Rowden IV signs a Warrior's Watch poster at Tommy's Sports Pub Saturday March 3, 2012 in Spring Grove. Daniel J. Murphy - dmurphy@shawmedia.com Supporters await the arrival of Spc Donnie Rowden IV at KC's Cabin Saturday March 3, 2012 in Spring Grove. Donnie is 21 years old and a Pathfinder with the 101st Airborne who recently returned from a tour in Afghanistan. Daniel J. Murphy - dmurphy@shawmedia.com Spc Donnie Rowden IV hugs a supporter at KC's Cabin Saturday March 3, 2012 in Spring Grove. 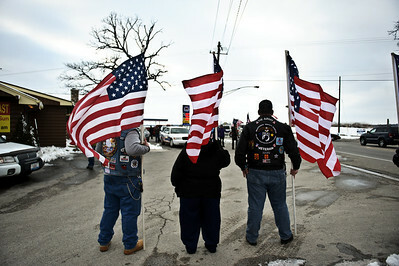 Donnie was welcomed home by family members, friends and Various veteran's groups. He is 21 years old and a Pathfinder with the 101st Airborne. He completed AIT and Jump School at Ft. Benning, GA. 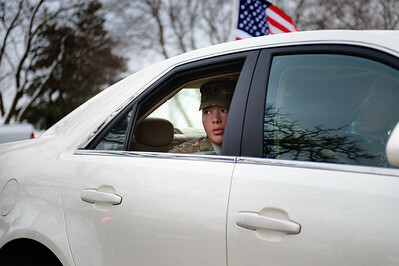 Deploying from Ft. Campbell, KY in February, 2011, the 19 CAB Unit just returned from Afghanistan. Spc Donnie Rowden IV was welcomed home by family members, friends and various veteran's groups at KC's Cabin Saturday March 3, 2012 in Spring Grove. Donnie is 21 years old and a Pathfinder with the 101st Airborne. He completed AIT and Jump School at Ft. Benning, GA. Deploying from Ft. Campbell, KY in February, 2011, the 19 CAB Unit just returned from Afghanistan. An avid outdoorsman, Donnie enjoys fishing and hunting and computer games. Before graduating from Antioch High School in 2009 he wrestled and ran track and now looks forward to attending college after completing his service.